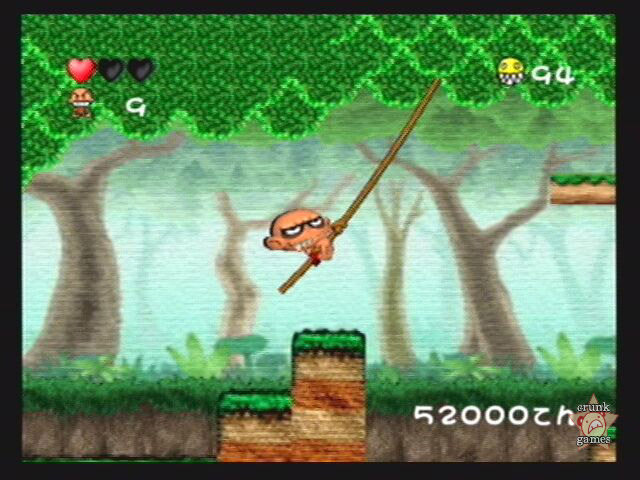 Prehistoric TurboGrafx hero Bonk is back in a remake of his very first adventure. 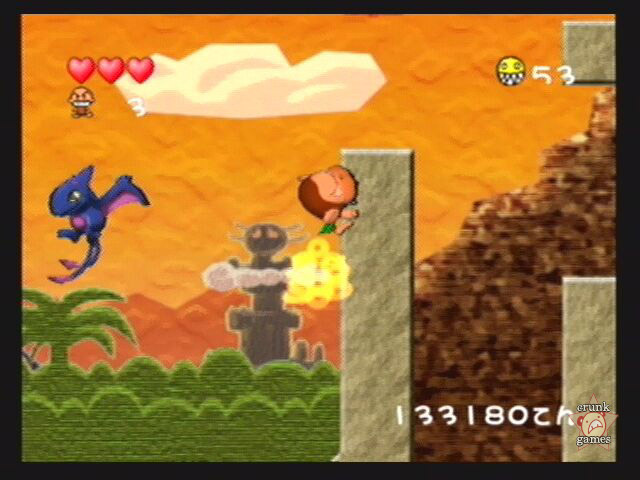 You know, you could probably find a few people who have heard of Bonk’s Adventure but never actually played it. Chalk it up to last decade’s console war: it was a heated battle with a lot of talk going around, but someone had to be left in the dust. In North America, that was NEC and their TurboGrafx-16, a modest little console that was a tad ahead of its time despite a first round of games only a step or so graphically above the best NES titles of the time. Bonk could be considered the Crash Bandicoot of his day. After all, he was an underdog hero on an underdog system, not exactly a mascot, but a charming character with a game similar enough to Mario to grab the spotlight. 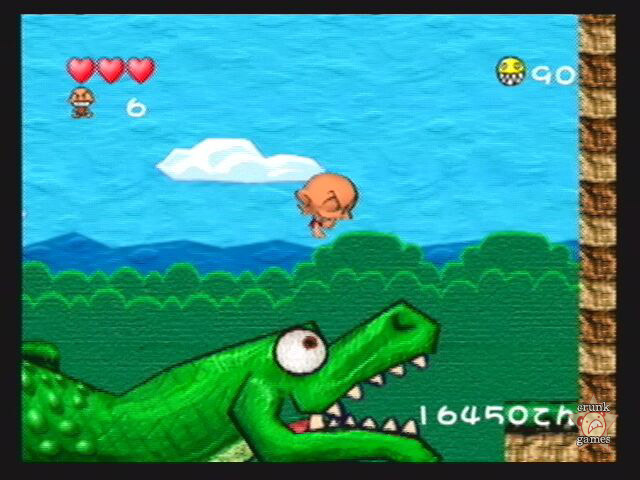 Bonk races through numerous prehistoric-style stages to eventually defeat King Drool and rescue Princess Za, using his enormous head as his only weapon. Bonk still controls the same way he always did, walking slow but carrying a big head. Combined with the slight hesitation in his jump, the methodical climbing by his teeth and the slow float of the spin bonk, this is not a speedfest like other platformers, but you still need to be careful. Everything has been imbued with a rougher, cartoonier edge, like the evil twin of Yoshi’s Story. Shockingly, Bonk’s gone from having a cheerful, optimistic expression to a permanent demented grin. But the levels are rendered very well for a 2D-style 3D game, with thick cel outlining to enhance the visuals and backgrounds that resemble pop-up books. 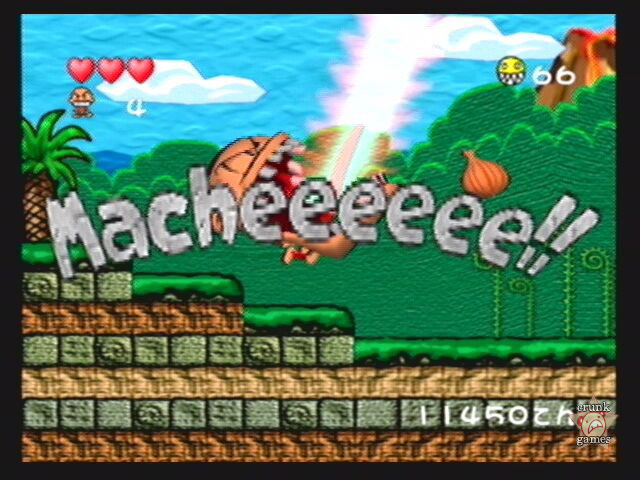 There’s also a heavy reliance on comic book sound effects which are in English, though it’s obvious the staff had no clue what they were putting in or just transliterated as best they could. Generally, this new version may not look as "natural" as the original, but it works regardless. The music has also been redone faithfully and still instantly recognizeable. Adding to the package are two extra difficulty settings (the third has to be earned), a sound test, new funny faces for Bonk and a collection of three television commercials from the original game. To get the commercials, you must collect 10 hidden gold medals throughout the whole game in each difficulty, which can be challenging just because of all the false walls you’ll have to be on the lookout for, and the rooms the medals are in require you to bonk exactly the right blocks in order to get up and reach them. After beating the game you can go back and select stages individually, so it makes things a little bit better to deal with, though not by much. The whole ordeal is little more than a way to squeeze some work out of a short and usually easy game, and only those obsessive enough will be bothered to go after the commercials, which are slim pickin’s anyway compared to what the Adventure Island remake offers. There’s also no way to unlock or play the original Turbo version, which would seem like a no-brainer considering the game’s low price. 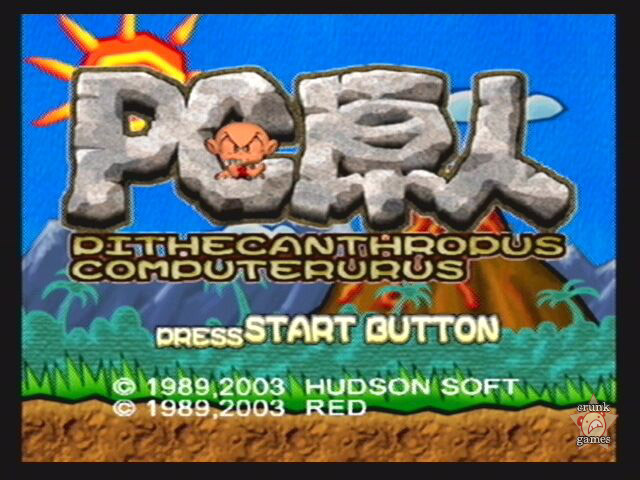 Bonk’s had a few outings on NEC and Nintendo systems, but the most overlooked game starring the little guy has to be Kyuukyoku (Ultimate) PC Genjin, the arcade game produced by Kaneko in 1994. 2-player like Bonk 3, Kyuukyoku didn’t seem to stray far from the originals, except that it put an emphasis on the smiley face symbols, which can be stacked on Bonk’s head and presumably increase his power. We’d tell you more, but unfortunaely the game isn’t emulated in MAME at the time of this writing.